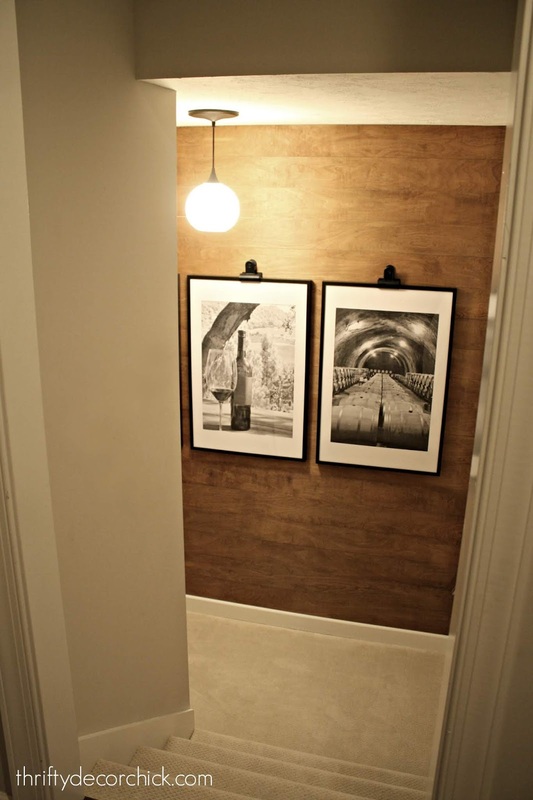 I first saw my project in a model home but haven't seen it anywhere since! 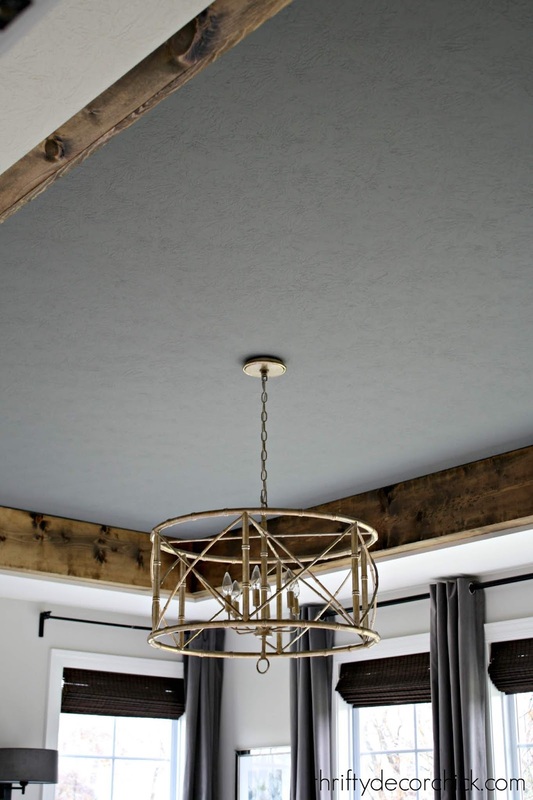 This was a different take on the typical tray ceiling treatment and we LOVE how it turned out! I had help with the first part of this project and because of that I did the steps a little backwards. I would have much preferred to paint the ceiling and then stain the wood after, but because I was at the mercy of someone else's schedule, I did the steps the opposite way I would typically recommend. It wasn't a big deal though. More on that in a bit! Anyway, the goal was to create "beams" around the sides of the tray ceiling. 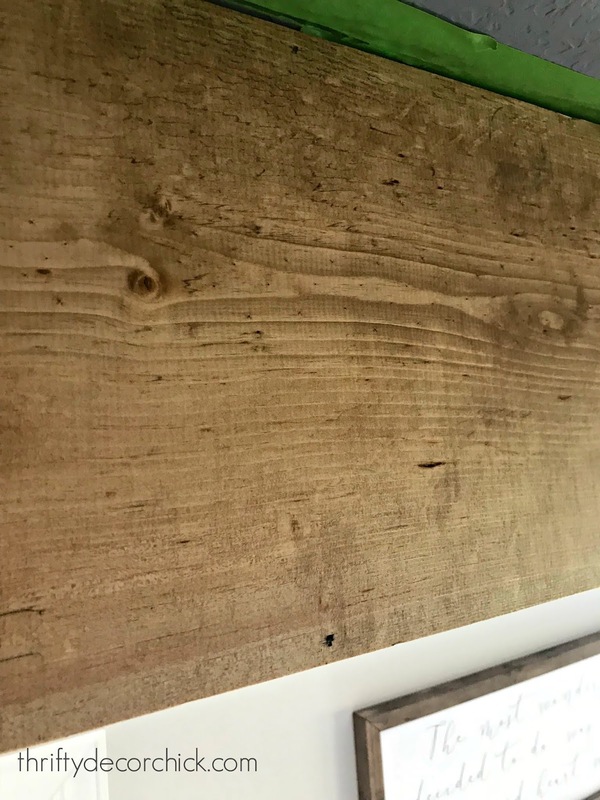 We had two options -- take the wood and 45 it on the table saw so when we nailed the side and bottom together, it would look like a true beam. 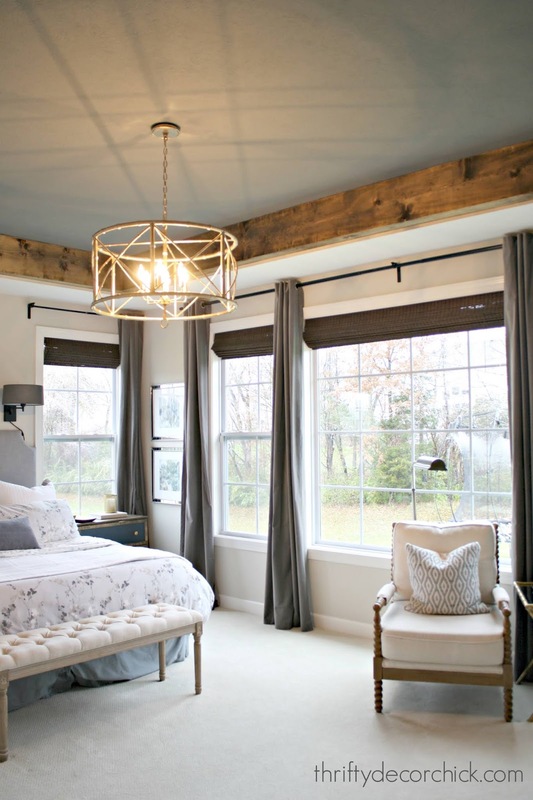 Or, take the two pieces of wood and just nail them into each other to create the look of a beam. We went with the latter, mostly because we were using very long pieces of wood -- two at ten feet and two at 16 feet. I don't trust that the mitered corners would have met up perfectly for the length of all the wood. I'm glad we didn't go that direction -- it would have been WAY more work and the final result looks great without that extra step. 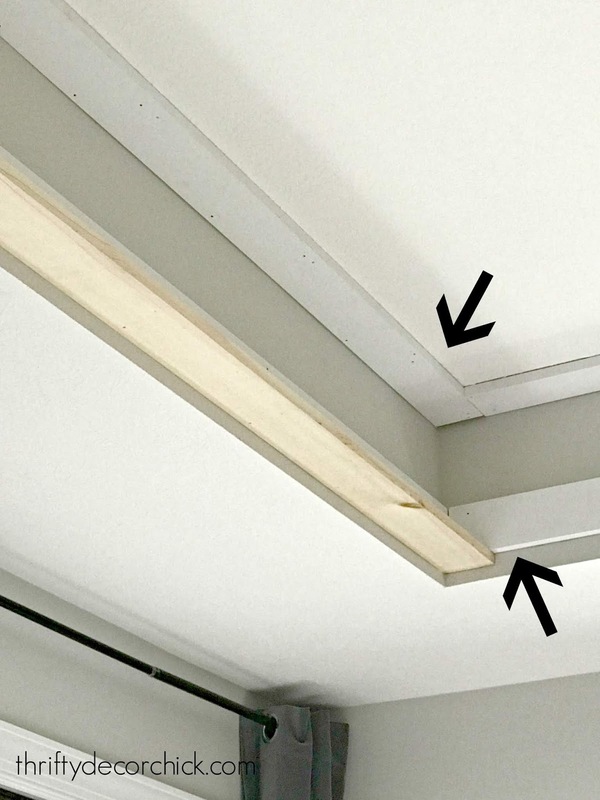 When you're done you have "beams" running around the tray ceiling. Like I said...the ideal way to complete this project would be to prep before hanging the beams. 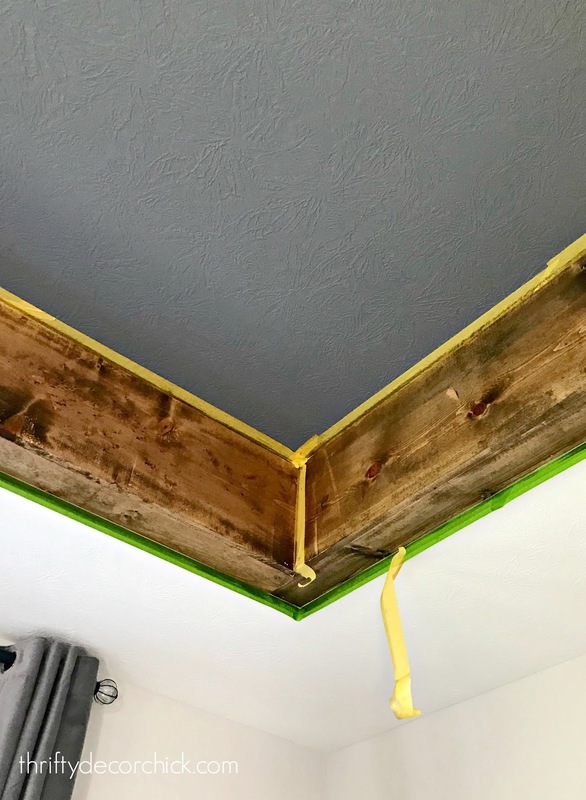 I painted the ceiling after the wood was up. Painting a ceiling is never fun but it went quicker than I though it would. I used a long painting pole to get the two coats up. 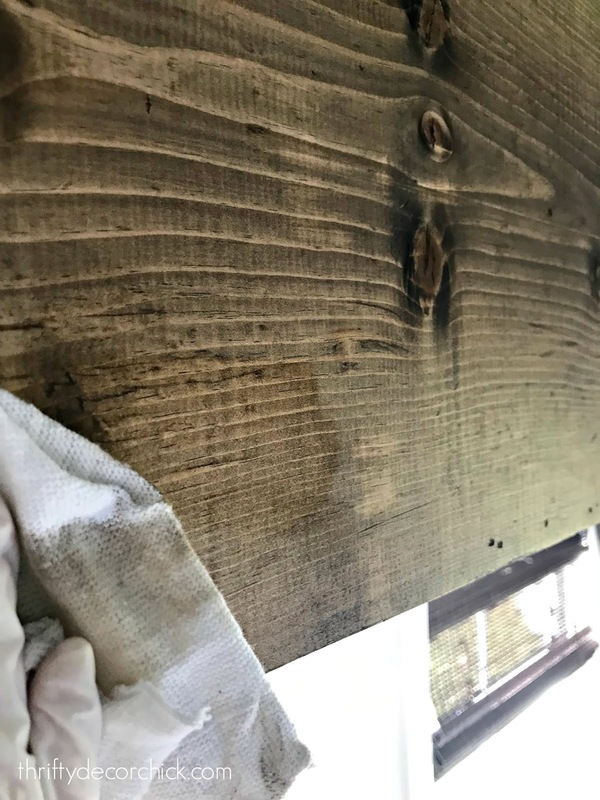 It's important to keep a "wet edge" when staining -- which means you want to be sure you don't apply the stain and then let it dry at all at any point. If you do, you'll see where you stopped and started. The conditioner makes it much more forgiving so you have a lot more time to work. See that edge there? Where it's wet and meeting the part I had just done? (The stain to the right looks like it's dry but I had just applied it.) If the wood was not conditioned some of that line would stay -- and it doesn't look good! 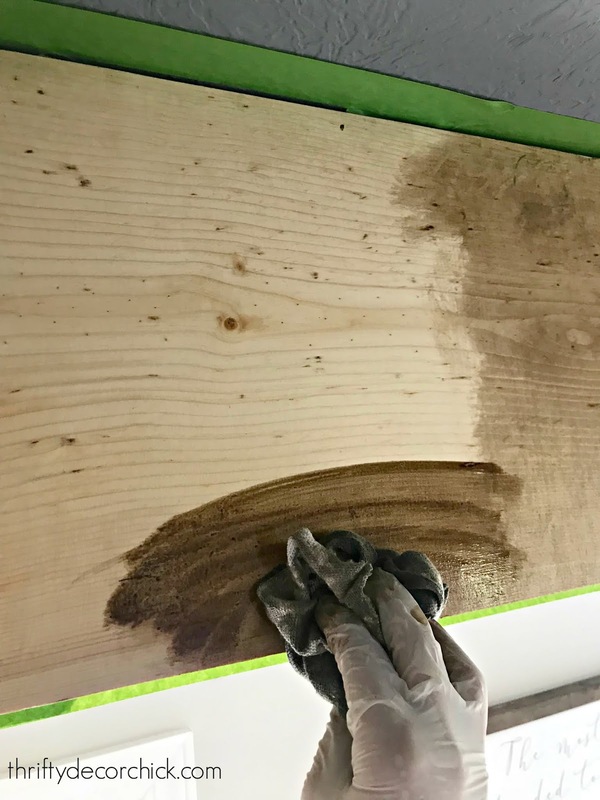 On the first beam, I did the first coat and stepped down to check it out. I usually only use one coat of stain on my projects -- more coats will deepen the stain but I find it's rarely needed. You may remember Jacobean because it's the color we used on the hardwoods in our old house. 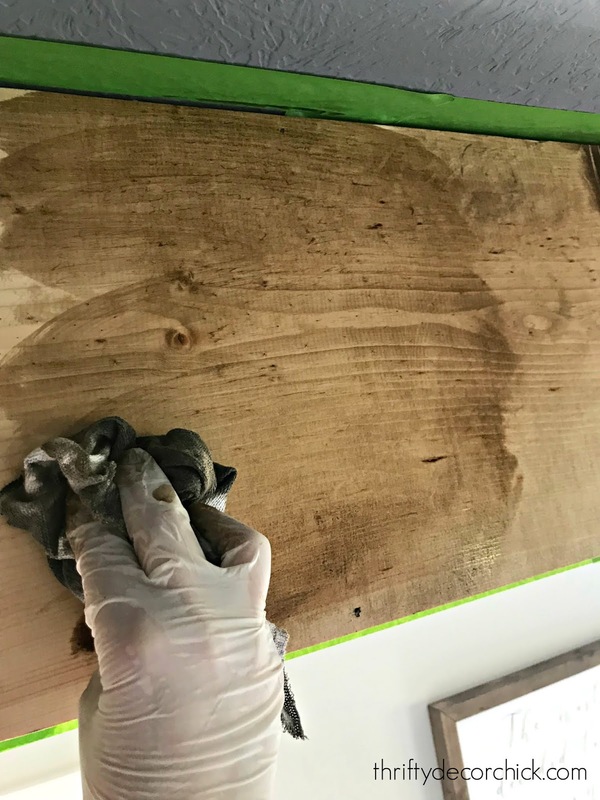 This is another reason I love working with stain! You can experiment with different layers of colors and get a custom look. 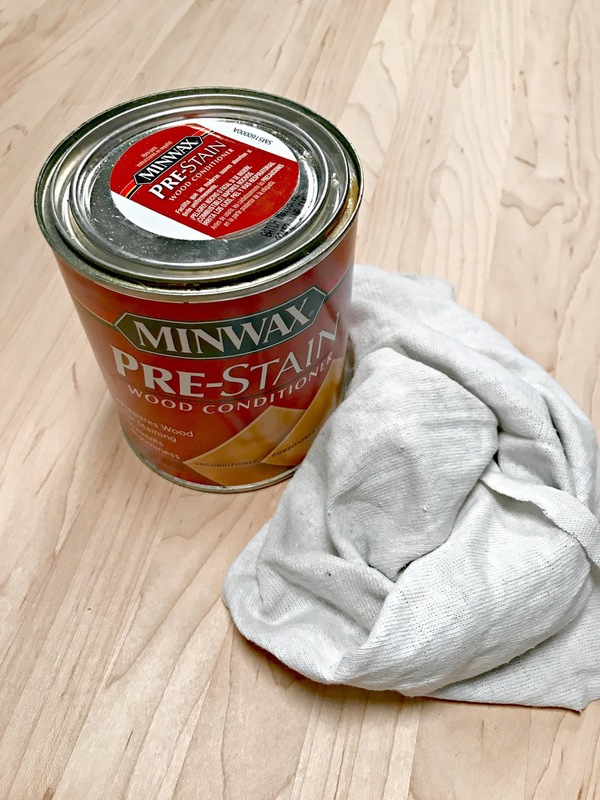 You can also mix stains ahead of time to find a color that's perfect for your needs. Again, you'll need gloves and a clean rag to apply. 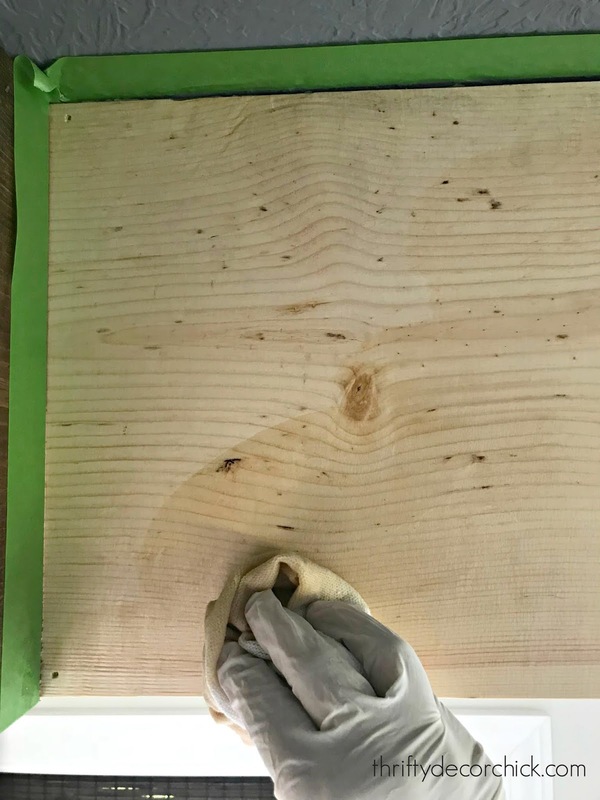 You can see how the poly on the left really deepens the stain and makes it look even better! One thing to note here -- when you stain there will be fumes! I had the windows open all day each day and had a air purifier running constantly. We didn't sleep in this room for a few days. There is a lot of gray in the room now but not for long -- this is phase one of two as far as changes to this room. Or maybe one of three...when you give a DIY blogger a cookie she wants to change a bunch of things. ;) I'm super excited about the changes coming up! And I'm considering painting the dresser now too -- still deciding on that one. Maybe black? If you can do the staining and painting before the wood goes up, that's ideal. But it really wasn't that big of a deal to do it after. I thought it was going to be a lot worse! 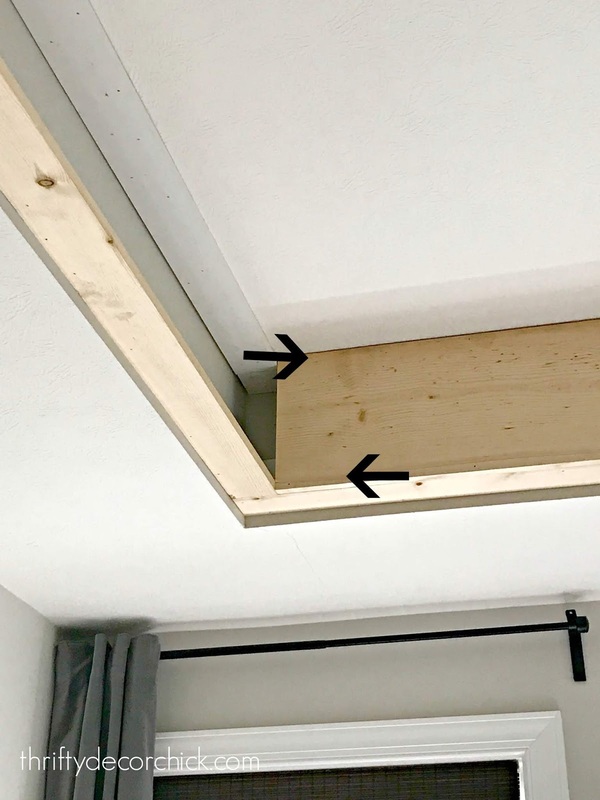 The 1x12 used for the side piece didn't go all the way to the bottom of the tray ceiling, which doesn't bother me at all. You don't even notice it. 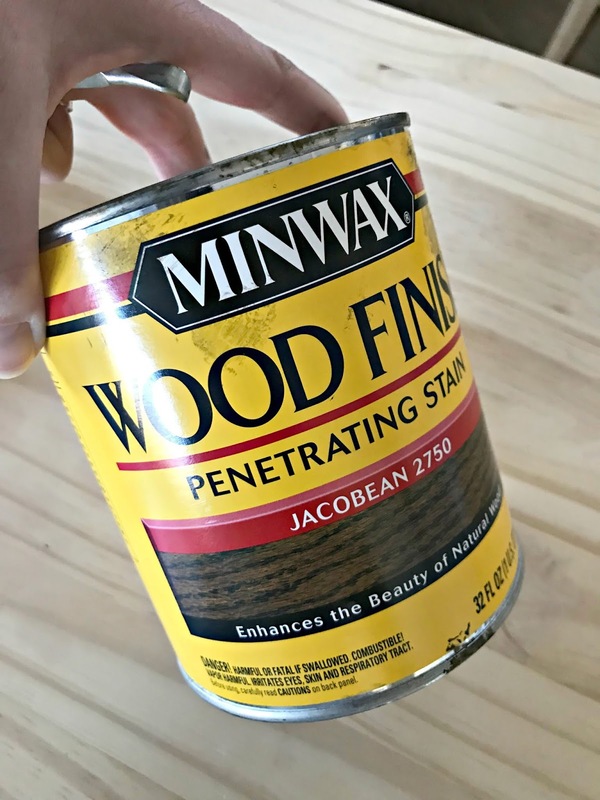 This post was sponsored by Minwax. I only work with brands and products I would recommend to readers. This is absolutely fabulous! 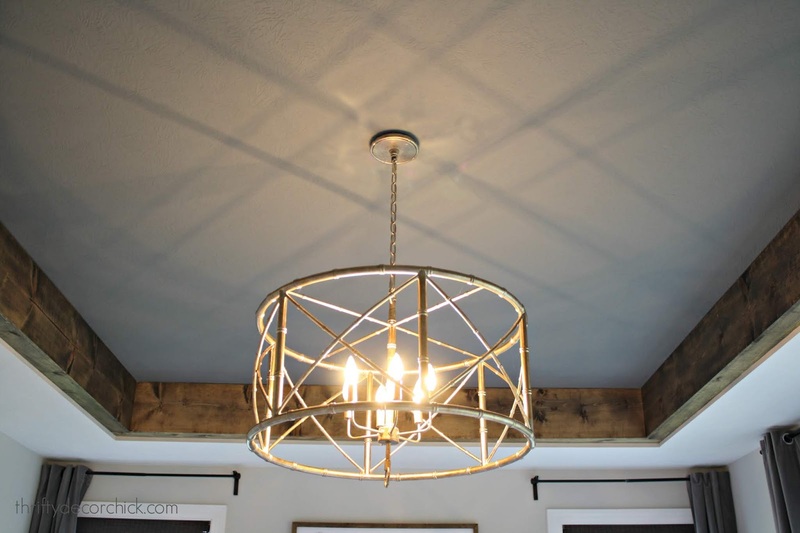 We are planning to build a house this next year and I think I might have to plan a place to put a tray ceiling just so I can try this! Dang, girl! You're good! This looks amazing! So clever to double up!! 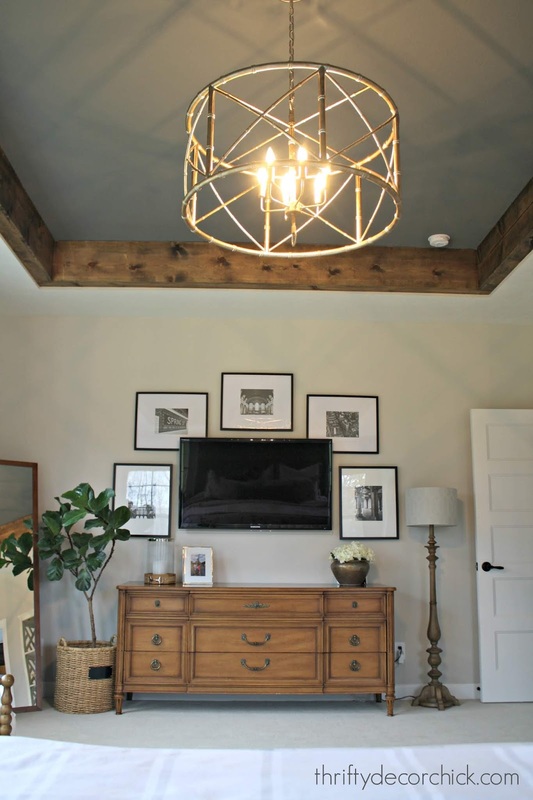 We added wood like this throughout our home and love the rustic vibe and low cost! We stained before to reduce vapors. That is gorgeous!!!! You are so creative with your projects. 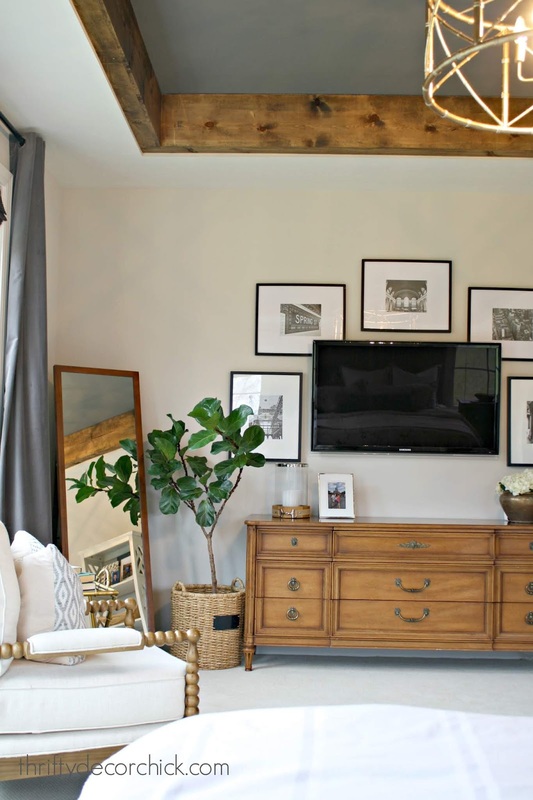 I love how everything in the room blends together. Don't do anything to the dresser, please! Now, about that smoke detector.... I know it's probably hardwired but it needs to be moved to the white part of the ceiling. Or is it just bothering me??? It looked great to begin with but now...just WOW! You never cease to amaze me with your skills! Love the results and your details explaining the steps. I may attempt this in my loving room. Keep em coming. I think it looks great in your space! I agree with comment above to NOT paint the dresser. I'm all for some wood tones and your master looks bright enough to carry off the wood. Enjoy!!! 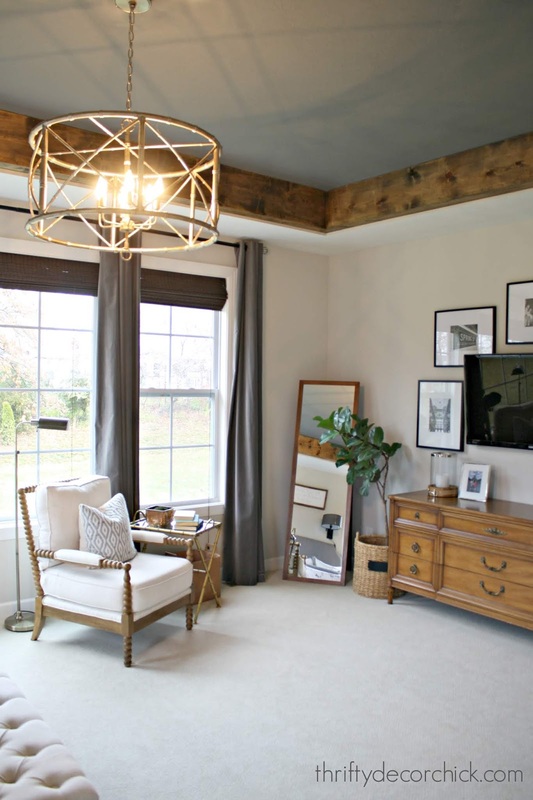 Want to add maybe consider some type of area rug that would bring some of the same warmth to the floor. Print, etc. Even just under your seating area perhaps.